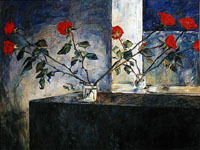 Kazanskaya's electronic gallery is maintained by her husband Dmitiri Manin who graciously provided images for this article. All of the images remain copyright by Maria Kazanskaya, and rights are reserved as detailed on her web site. This article is quite long, and contains many images which take time to download. Accordingly it is broken up into sections. Each one has a bar at the top labeling each section - and at the bottom a bar labeled previous and next. You may wish to turn automatic loading of images off if you are on a slow connection - and then click on the space for an image as you need it, so that you can begin reading immediately. Introduction - Why this painter and on what grounds her art should be considered. 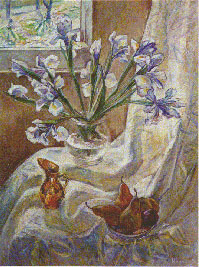 Irises - Why depiction of objects is symbolic, and how the way that depiction and abstraction create the world of the painting. Irises and Pears - Why we should be concerned about the working methods of painters and the texture those in the images that those methods produce. Interlude of Ambiguity - On what this tapestry of method and idea produces and why it is a change from the standards of Modern art.